At Budget Blinds of Tri-Cities & Ridge Meadows, we're your local neighborhood experts that truly understand your needs. 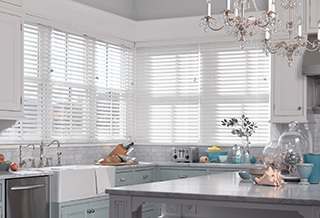 We're in your neighborhood, we know the local Tri-Cities & Ridge Meadows weather and community, and we’re backed by the #1 provider of blinds, shades, and drapes in North America. Over 25 years of customer satisfaction gives you peace of mind that only comes with choosing the proven leader. We bring the showroom to you in Tri-Cities & Ridge Meadows. We expertly measure your space, install beautiful window treatments, and back it up with the best warranty in the business so you can sit back and relax in the beautiful, Tri-Cities & Ridge Meadows weather and sunshine. We serve to give you the best in window treatments, so you can rest easy knowing your space will be beautified and optimized with window treatments that fit your individual needs. Thanks again to Andria. This is second condo where I have used Budget Blinds and with a couple extra challenges (due to loft height ceilings).....looks great and makes a difference. Amazing customer service! Joan who came out to do the quote was very patient with me as I changed my mind a couple of times... and then Jackson who installed them was very fast and efficient. There was a tiny flaw that I didn't even see and he replaced the part! I wouldn't hesitate to recommend this company and would definitely use them again. Excellent service, lots of choices and great customer service! Thank you Budget Blinds - now the children at Best Friends Children's Centre will be comfortable in their space and most importantly a dark nap room! Thanks again!